Type I-II Portland Cement | Salmon Bay Sand & Gravel Co.
Portland Cement Type I-II is one of the primary components in making concrete and portland/lime mortars. When mixed with sand and coarse aggregate it produces concrete. When mixed with lime and mason sand it produces mortar and stucco. 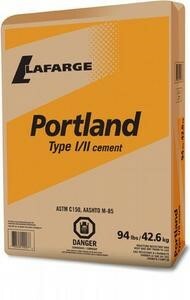 Salmon Bay sells this standard cement in 94 and 30 pounds sacks as well as in Bulk Bags. Type I-II Portland Cement meets or exceeds all applicable chemical and physical requirements of ASTM C 150 and CSA A3000-08.